This is a very thick pizza pie that carries significant weight in yummy pizza goodness. Besides the thickness, the order of ingredients is a bit different than a traditional Margarita or NY style pizza. The cheese in a Chicago Deep Dish goes under the tomato sauce. The reason for this is that this hefty pizza needs ample cooking time and if the cheese were on top, it would burn. As the name implies, it was created in Chicago. Uno Pizzeria opened in 1943 and was the original creators of this style of pizza. There are now over 130 Uno Pizzeria locations nationwide. While Uno Pizzeria was the first, many followed and some of the more popular Chicago Style Pizzerias still had origins in Uno’s. Lou Malnati was the original cook at Uno’s and eventually went off to start his own pizza shop.Today, Lou Malnati’s is one of the more popular pizzerias in Chicago with over 53 Chicago area locations. Gino’s East is another popular pizza spot in Chicagoland and one of their founding pizza cooks, Alice Mae Redmond, spent many years at Uno’s. There are certainly others, but these three pizza spots are excellent and have deep roots in the origin of the Chicago Deep Dish. While none of these places are in North Dakota, there is some good news. First, I am going to share my recipe with you. Second, all three of these pizza places ship! So, you can get online and have a Gino’s East pizza shipped to your doorstep! I don’t even care if it isn’t pizza, even though that is what I call it. Whatever you name it, it is delicious and that is why I eat it. This recipe is of moderate difficulty and does require some care and attention. I recommend a pizza stone and a specific pizza pan. You can get away with substitutes, but I am choosing appropriate tools because I want to help you make an awesome pizza! We also use some pretty exact measurements for the same reason. One thing I have learned about baking is that measurements matter. 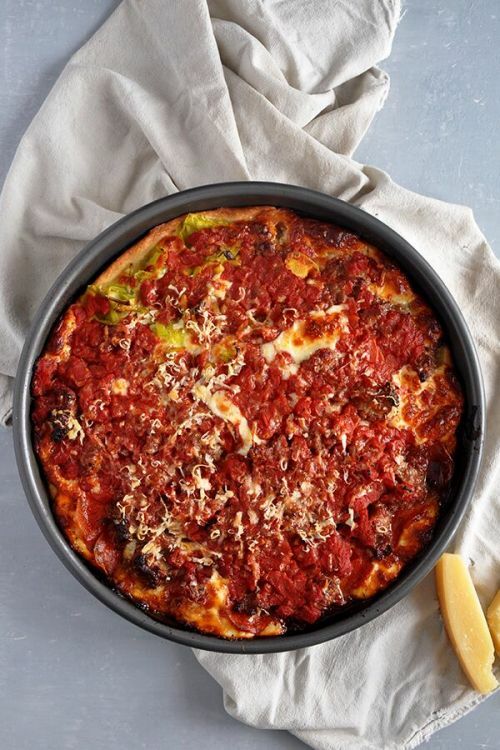 For some pizzas, you can get away with loose measurements, but this recipe and it’s precise measurements will really help you make one awesome Chicago Deep Dish Pizza. Many will often describe a Chicago Deep Dish Crust as extra bready, but I disagree with this. Yes, the crust must be able to hold our several pounds of ingredients, but it doesn’t need to be that much thicker than a normal crust. In fact, I add about as much flour for this crust as my normal crust, but I just make sure it is cooked in a way where it has the structural integrity to hold all the stuff! The traditional Chicago Deep Dish is Italian Sausage, but you can use whatever you need! For high moisture ingredients, you will want to drain the liquid from them. We do the same thing with our tomatoes in the sauce. The problem with having a pizza so big that it is like a container, is that it also contains all the moisture. We want to get rid of that! Honestly, this is a pizza that I love to make and do so when we are in the mood to treat ourselves. It is a big pizza with big flavors and a ton of Chicago flair! Spread dough to cover bottom. It should be flat and even all along the bottom.